Saturday the 15th of September sees the start of this year’s North East Open Studios (NEOS) event where artists and artisans from across the region open their studio doors to the public. The work on show includes painting, sculpture, ceramics, photography, textiles, jewellery, leatherwork, glassware and multimedia creations, and styles range from the traditional to the contemporary; there is truly something for everyone! 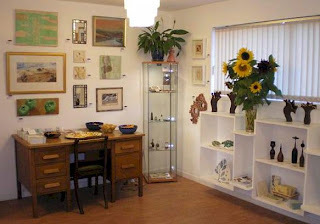 Amongst the galleries taking part is Platform 22 in Torphins where owner Emma Pattullo will be exhibiting a range of her own ceramic designs. Emma has enjoyed a busy year as apart from tutoring a range of successful classes at Platform 22 and Woodend Barn her own work has become increasingly sought after, in particular her vases in black clay edged with real gold and her range of platters depicting butterflies, dragonflies and bumblebees! She has also found time to experiment with ideas such as ‘freeform’ mirrors inspired by the work of Gustav Klimt and some more sculptural work featuring a ‘dreaming ballerina’. Apart from exhibiting her own work Emma and husband David will also be playing host to a range of other artists in the gallery. Amongst those showing at Platform 22 are painters Timmie Penny and Stephanie Vandem, photographer Robert Grey, ceramicists Mina Rusk and Sandra Gorrara, textile artist Annabel Pattullo and wood turner Alan Steele. As well as being able to enjoy a wide range of exhibits visitors to the gallery will also be able to see an artist at work with wood turner Alan Steele giving demonstrations of his skills making ‘fairy goblets’ during Saturday 15th and Sunday 16th. During NEOS week Platform 22 will be open from 10am to 5 pm and the gallery’s café will be operating offering weary culture vultures a chance to enjoy a restorative cuppa! This year’s NEOS event, the fourth since its inception in 2003, is the biggest yet with nearly 160 individual artists and over 20 galleries involved and runs from the 14th through till Monday the 24th. NEOS has now become a big part of the arts scene in the north east and a many people now take the week off to spend it touring the studios and galleries on the north east searching out the very best in local artistic talent. To this end the NEOS organising committee produce a comprehensive directory and map covering all the venues involved, from Nairn to St Cyrus and Fraserburgh to Tomintoul; these are widely available from galleries and art venues around the area. 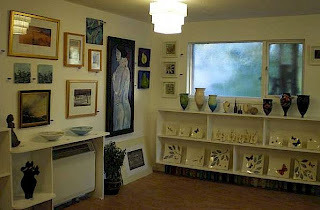 Further information can also be found online at www.northeastopenstudios.co.uk. 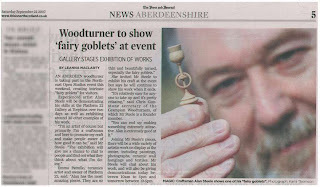 Wood-turner Alan Steele will be hard at work this weekend producing “fairy goblets” for Queen Tatiana’s autumn garden party! Visitors to the Platform 22 Gallery in Torphins will be able to watch Alan demonstrating his intricate woodturning skills and may even catch a glimpse of the reclusive fairies as they wait eagerly for Alan to complete his work. As well as being able to watch Alan at work the gallery is also hosting a major exhibition of his work for the North East Open Studios event with over 30 examples of his work on show. 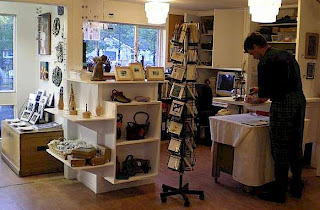 Although born in Cheshire and raised in Yorkshire Alan is now based in Aberdeen where he has his workshop and from where he founded the “Grampian Wood Turners” group whose aim is to promote the art of woodturning in the northeast. Alan began his career as an artist-craftsman as a young boy carving jet from the beach at Whitby and helping out at a local blacksmith’s making fire irons. As a teenager he became an “indentured apprentice” with an engineering company as a turner/tool-maker. It was a rude introduction to the world of work as his wages didn’t cover the cost of getting to work and feeding himself so he kept on his job with the blacksmith and progressed on to making copper jewellery which he sold to supplement his income! 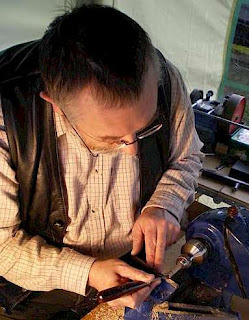 Having gained a reputation as a skilled craftsman Alan began exhibiting his work at various cultural and folklore festivals at home and abroad. 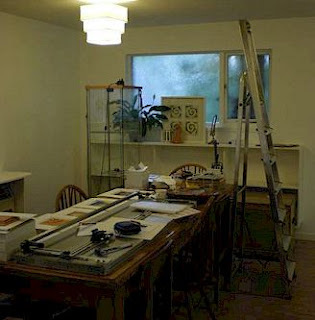 The insight he gained into other cultures and crafts helped him expand the scope of his work and he soon developed his skills in leatherwork and wood turning. Today these two materials, leather and wood, form the basis of nearly all his work and although most of his pieces are made from one or the other he has had considerable success in making items from a combination of the two! Today Alan draws his inspiration from the natural world and the titles to the pieces reflect his knowledge and love of folklore and mythology. The exhibition at Platform 22 is comprised of a range of turned screw-top boxes in hardwoods and thin-walled “hollow forms” made from unseasoned timbers and coloured with dyes to create the most amazing pieces of art that seem to defy gravity, as well as description! Alan will be on hand to talk about his work and give demonstrations throughout Saturday 22nd Sept. (10 am – 5 pm) and on Sunday 23rd (12 noon – 5 pm). The gallery/cafe will be open showing Alan’s work alongside a wide selection of ceramics, photography, paintings, textiles and jewellery throughout the NEOS week (15th – 24th September, 10 am –5 pm). For more information telephone: 01339 882039. The Week Rushes By... and Now Its Over! My goodness I cannot believe that we are on the second weekend of NEOS already.... Saturday and Sunday have now passed and its the last day, hopefully the Aberdeen holiday will bring the final NEOS visitors out to see us! Sorry, once again Platform 22 got really busy and I never managed to write my posts! It is Tuesday afternoon now! But, WOW what a fantastic NEOS week! From start to finish it has just been so busy ~ we even were visited by some fairies!!! I'll tell you more later. 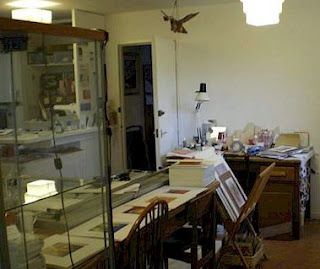 We moved my long work table out of the studio for the opening night, to maximize standing room. Which was just as well really as I don't think that we had any less than 60 people at any one time. Some friends who came to the opening were very impressed that I even had a celebrity come along, Carol Baxter from television's Beech Grove Gardens! There is a picture of her right eye and forehead to prove it on some body's mobile phone!!! Ha! Ha!! Anyway (as you can see), David had the great idea to bring the garden tables that we got for the summer cafe for outside the gallery, into the studio. It worked brilliantly and I think it really helped to tempt the foot sore culture vultures to rest their feet and regenerate their strength! It was a fantastic way to really launch the cafe to Torphins village and hopefully put us on the map. The picture above is showing a relatively large goblet; Alan made a couple that are only 13mm high - absolutely stunning! 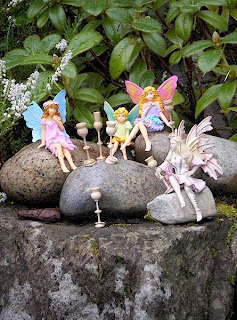 As I mentioned earlier, we were even visited by fairies ... they were tempted here by the beautifully turned fairy goblets. So Platform 22 had Fairy Queen Tatiana's Autumn Garden Party at the bottom of the garden!! But I cannot stress how fantastic NEOS is, I feel encouraged by my conversations with people and enjoyed sharing stories and exchanging ideas with artists and enthusiastic people alike. I think that one of the great things (there are many) about NEOS is that the people who take the time to visit you are keen to find out more and want to know why, how and where you make and you work. If there was one event I could recommend to any artist to promote themselves and spend their money wisely I would say North East Open Studios every time. I had a great conversation with a customer over her cup of tea and cake, about how it is so very difficult to get the public from just around the corner to come in. This lady had a book shop and on her days off from work was touring North East Open Studios by bus! She commented how people from far and wide knew about her book shop and yet the villagers had not popped in, some of whom walked by maybe daily! So yes, my challenge (one of many) for 2007 and '08 is to get our locals involved and aware of what we offer!! Saturday 15th Sept - The morning was a little slow, but it wasn't surprising as the weather was foul! But by 11am things really started to hot up. By 3pm Platform 22 was full to the brim with people having teas/coffees and chatting about the various artists and the work on show. And of course buying lots of work too! At the end of our first day I would say we have had about 40 people through our doors. 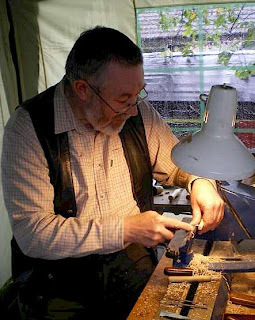 The highlight to Platform 22's NEOS first weekend was Alan Steele, who took shelter in his gazebo outside and worked at his lathe all Saturday and Sunday, turning the most beautiful fairy goblets which we have on sale along side his stunning wooden hollow forms and boxes exhibited at Platform 22. Sunday 16th Sept - Again another busy day, but much more steady than Saturday. Funnily enough I had a friend to come help me with the teas from 2:30pm until 5pm, but the minute she arrived the cafe took a slow down ... which was probably a good thing as we were about to run out of cups, cafetieres and plates ... so she got stuck at the sink instead!! Again, Alan Steele worked away at his lathe in the cold, but he always had a captivated his audience even in the windy cold weather. I have still to grab a moment to pop out the door and watch him at work! Had some very interesting people in on Sunday, chatting about the other artists/exhibits and how wonderful everything was. As well as how many talented people are out there, that, nobody really knows about, let alone what they do. I love the fact that they are so keen to meet and talk, it is how it should be all the time ... but then I'd never get any work done (Tee Hee!). I think on Sunday there must have been at least 45 customers visiting Platform 22. If you read my blog that I posted on Sunday evening I could hardly string two words together - I was so tired. I am just about caught up with my energy levels today. Don't get me wrong I am not complaining in any form, I love NEOS to bits, it is such a fantastic idea for everybody. 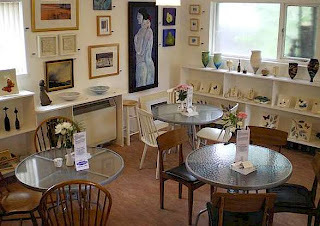 If you are in Aberdeenshire, Scotland why not look up NEOS on the web at www.northeastopenstudios.co.uk and visit Platform 22, as well as many more fantastic locations! It will be worth it and we'd love to meet you! North East Open Studios is here! Well all I can say is WOW to the beginning of NEOS! WE certainly started with a big "BANG"! I am rather taken aback by how busy Platform 22 has been. Not only getting ready for the big preview launch, which meant working until about 3am for the week before, but the Preview evening and the weekend since. This, so far, since joining North East Open Studios has been the best year yet. Friday 14th Sept - I don't really remember much about the day apart from playing permanent catch up! I had to collect the jewelery, make all the labels for pricing the work (which the computer took an instant dislike too), wash the floor as well as do all my mothering duties too. I was a whirl wind that day. I heard at about 5:50pm that STV News (Scottish Television) were showing the interview that a group of NEOS artists had done earlier in the week (including a snippet of me... nerves got the better of me I'm afraid and I don't know where the words went!!! - So I'm nervously curious) so I spent the next half hour desperately looking for a video tape to record it whilst trying to have a bath and wash my hair... put it this way the corridor between the bath & the telly was rather wet! AND THEN after all of that STV never showed it - I was disappointed for NEOS but relieved for myself! We hadn't even reached 6:30pm (opening at 7pm) when people started to arrive, and it never stopped from there! We were packed into Platform 22 ... I would say that we had 50 - 60 people here. I never left the till and if I did it was only to place a red dot on an item! We kept going until about 10pm. What an amazing atmosphere and spectacular evening. And ... Ready! Set! GO!! It is now Sunday evening, the first chance to sit and not collapse in a deep sleep since Friday evening. I am trying to put words into action, but too pooped! Everything was and still is a huge success, but I'm sorry you will have to wait until tomorrow before I can get my head around writing my next post! Yes, I know, it is the end of only day two of North East Open Studios, but I'm done in for today. I promise to tell all tomorrow! I can't remember if I have mentioned, but, on Saturday 15th and Sunday 16th Alan Steele is joining me here at Platform 22 in Torphins with his lathe and wood turning skills. He will be turning the most AMAZING tiny fairy goblets. They are beautiful and I'm really excited. So if you are in the area, don't forget to come see us. 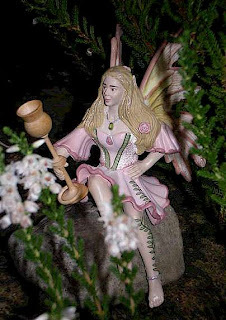 I'll try to post a picture of the fairy goblets in the morning. The detail and precision is just wonderful, I've never seen anything like it. Hopefully Alan will come back again the following weekend to make some more! An ideal present for any little girl or boy. Something to get their imagination going! I've already started thinking of who I can give them to! Anyway, it is now 1:15am and I must go to bed! Goodnight! Today has gone really rather well, this is somehow strange ... I can't help thinking "what have I forgotten?" I hung all the work today. I even ran out of picture hooks at one point... so some pieces are hung with humongous nails ... I started at 9am(ish) and kept going until 3:31pm! At which point I realised I hadn't gone to collect my daughter plus her 2 friends from school nursery, and so, ran down the hill, jumped (almost flew) the wall into the school playgroup (this activity is not allowed, it is a bad example to set the children ~ I once got caught .. BIG OOPS! ), but, nobody was watching today! All OK and in the end because of my flying short cut I arrived before most of the other Mums! Anyhow, once I got back I spent the rest of the afternoon arranging the ceramics and wood work. 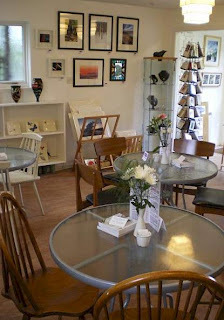 I have to say I'm really pleased, the gallery looks AMAZING and it is a fabulous show this year!!! OH it just GREAT!!! I have sadly got a lot of tidying to do tomorrow! So, tomorrow morning I hope the two jewelery people are dropping work off, I will arrange what they give me. Try to quickly finish off all the pricing and labling (ugh) I hate this part. Then I'll finish tiding up, do the last minute fiddles and wash the shop floor... then hopefully hop into the bath myself, relax (? ), by which point it will then be time to pick up the girls... we will have (I hope) a lovely afternoon together and not step foot into the studio, quick and early supper, get changed and put on the old face ... take down the window screens ... and then ... its the BIG opening.... Wish me Luck! So no pictures today ... I would like to show you my progress, but then it will spoil my first nights opening ... you'll see them on Saturday. Funny to think the preview will be over this time tomorrow. I hope lots of people turn up! Please come and see us if you are in the area, there is something here for everybody, and all budgets too! 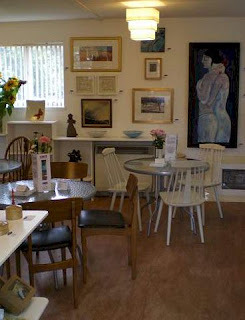 Or, come have a cuppa & sit back & enjoy! Well almost 2 days to go! It's nearly 2am & I have finished for the day! Wednesday 12th Sept and the - I have delivered two lots of work to galleries ~ the Milton outside Banchory and the Butterworth at Balogie. I also collected the prints (x25) of my "Up Close and Personal" (fruit) series and have spent most of the day cutting mounts for them and this evening wrapping them in plastic wrap ... not very taxing ... rather tedious really as I have so many other things I should really be getting on with. Luckily all the artists have delivered their creations and master pieces by the deadline of today. PHEW!!! My favorite part of today (sad as it may be) was shutting the shop at 5pm, putting up my window screens (hiding the next couple of days until the big off) ... and taking ALL the work off the walls and shelves. And then slowly, but surely, chaos spread across my one haven of tranquility in our home. My studio gallery is one big mess!!! See what I mean!!! AGHHHHHHHHHHH! Now the walls are bare, looking big and empty, and, I have finally finished poly filling all the nail holes and repainting the walls ~ there were surprisingly rather a lot of holes. Well the countdown has started! Sunday 9th Sept ~ Husband decided that it was a good idea to get out with the kids ... change of scene ... breath of fresh air ... It feels as though I have had my head stuck in my kiln for about 2 weeks now, getting pieces bisque fired, glazed and some pieces lustre fired, as well as pieces for Mina Rusk who is also exhibiting at Platform 22 for NEOS. Its amazing what starts to happen when the pressure of a deadline approaches... then the panic attack starts ... what have or haven't I done? Monday 10th Sept ~ Hours, minutes and seconds have no meaning. Where is my list and my list of lists? I know I should have emailed out all my press releases last week and earlier... but no, not me. What about the invitations... Everything is getting done right now! And I've just run out of mounting board, as have most of Aberdeenshire I've now discovered ... some art shops are holding back their stock supply, because its in such high demand so don't want to let it all go!!!! Oh help! 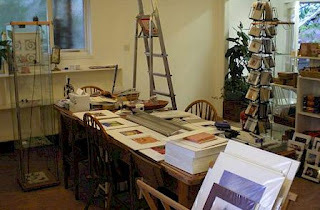 Yes I know it sounds as if its mayhem here in my studio gallery. Most of it is in my head. I'm not making much sense these days and I keep forgetting where I'm going with conversations (too much to think about), but somebody said today "no change there then!" - thanks for that! This part of the week is a bit like the lull before a storm. I cannot do anything until I have all the work here. I don't know what my artists are bringing me to an extent, this can be nerve tingling but also very exciting. Some work has started to arrive and I'm beginning to feel more confident. This is going to be a great show! Tuesday 11th Sept ~ Invites are out - most of them (check), press releases sent (check), weeding flower beds (sorted), posters out (check), work almost finished (ish), prints printed & mounted (tomorrow), walls painted and poly filled (tomorrow) drinks & nibbles for opening night (check) , hanging picture and installing work (all day Thursday) Panic (Friday afternoon only) ... so you see I'm getting there. I just have to keep telling ... reminding myself of that! So, do come and join us for the opening of this years NEOS exhibition at Platform 22 on Friday 14th September 7 to 9pm. Celebrate with us over a glass of wine! But, if you cannot make it to the opening NEOS at Platform 22 is open to the public from Saturday 15th to Monday 24th September 10am to 5pm daily, it would be lovely to see you. 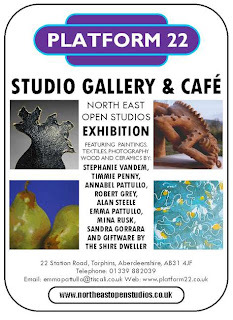 Artists and makers showing at Platform 22 with Emma Pattullo are Timmie Penny, Stephanie Vandem, Robert Grey, Jan Holm, Mina Rusk, Sandra Gorrara, Annabel Pattullo, Alan Steele, Jane Frazer, Alex Philp, Michael Zappert and the Shire Dweller. 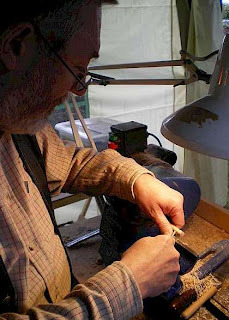 As well as being able to enjoy a wide range of exhibits visitors to the gallery will also be able to see an artist at work with wood turner Alan Steele giving demonstrations of his skills making fairy goblets during the Saturday 15th and Sunday 16th. During NEOS week Platform 22 will be open from 10am to 5pm and the gallery cafe will be operating offering weary culture vultures a chance to enjoy a restorative cuppa! Hope to see you soon! I'll keep you posted as things progress ... hopefully lots of images soon! I have hardly had time to get back to make more posts, I apologise. Its heads down and work hard ... deadline next Friday! Platform 22's preview night for its part in North East Open Studios 2007. My kiln is firing away non stop with no room for mistakes. So, for now, I must get on ... & try to make more posts with pictures (as and when I can) ... So, for now it is hard slog and no procrastinating!! !